Musician Jerickson Villacarlos is the oboist of The Band of The Blues and Royals, one of the 22 bands in the Corps of Army Music (CAMUS). 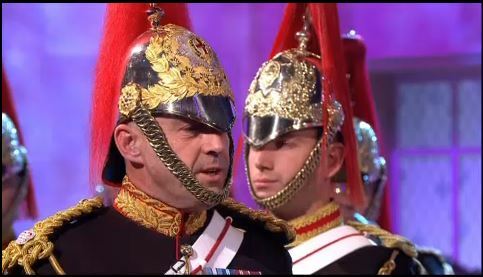 He passed out of Phase 1 Training in Army Training Centre (ATC) Pirbright in September 2011, Phase 2 Training in the Royal Military School of Music Kneller Hall in November 2012 and completed the Household Cavalry (HCav) Mounted Dutyman Course in June 2013. 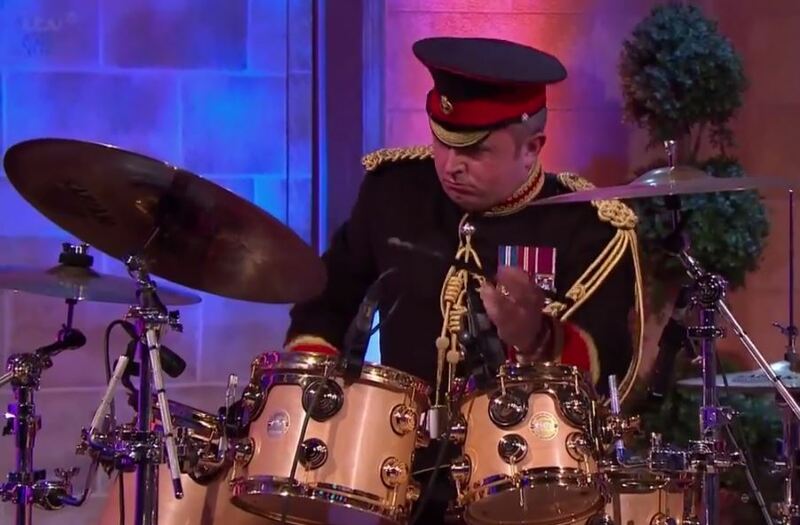 Here he talks about the experience of being on the day-time TV series Alan Titchmarsh with his band. Within 24 hours of playing for the Soldiers’, Sailors’, Airmen’s Family Association (SSAFA) charity with the Windsor Military Wives Choir in the Queen’s Theatre in Hornchurch, we set off on the road with bright eyes and bushy tails. 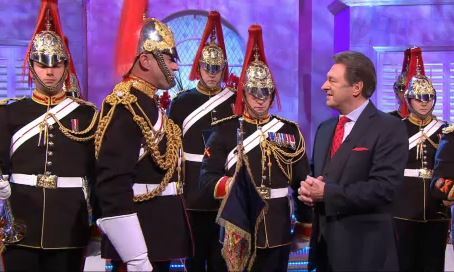 This time, we made our way to the ITV Studios in Central London to appear on the Alan Titchmarsh Show. The Band has appeared on TV before but this was my first to go in a TV studio. I was thrilled and full of anticipation to be involved in another unique opportunity to represent the British Army. We unpacked our instruments, uniforms and other kit with the help of supporting staff from the studio. We were then led to our dressing rooms and the so-called ‘green room’ where a generous amount of refreshments of cold soft drinks, hot beverages, delicious sandwiches and a tray full of fresh fruits awaited us. Needless to say, we were very well looked after. Not long after arriving, we touched up our uniforms; Brasso cleaned our helmets, straightened our plumes and ensured our boots, spurs and belts had that mirror shine, nothing short of the stringent standards of the Household Cavalry. I then quickly prepared my reed and warmed up the oboe. Soon, donning our uniforms, we descended down to the set to briefly run through our segment on the show… by ‘brief’, I mean only 10 minutes! We stood on stage observing and awaited directions. It was interesting to see what goes on in the a studio with staff doing their tasks adjusting lights, cameras and microphones. Following a warm welcome from Alan Titchmarsh himself and the cues from the studio staff, we proceeded to record. We prepared a piece called “Fehrbelliner Reitermarsch” featuring four of our State Trumpeters led by our Trumpet Major Phil Bishop and a piece called “Sing, Sing, Sing” featuring our soloists: Band Corporal Major Stuart Marsh on the Drum Kit, Lance Corporal of Horse Tim Garner on Alto Sax and Lance Corporal Evatt Gibson on Trombone. After the opening, Alan chatted to the band. The Director of Music (DOM) Major Jason Griffiths spoke about the exciting times ahead for the Corps of Army Music (CAMUS). He told him about next year’s reorganisation and that in April 2014, CAMUS will be forming the UK’s first 3 professional Brass Bands, 3 Rock and Pop Bands and the new Corps of Army Music String orchestra. He went on to say that the Corps is still recruiting and we need quality musicians to join us. He reminded the viewers that all instrumentalists (including guitarists, string players, vocalists as well as the standard wind instrumentalists) are encouraged to apply. The producers were happy with the set. We exited stage left and packed to return to Windsor. Certainly, it has been an insightful event for me to see what goes on behind the scenes of a TV show. Back in Windsor, we returned to the practice room the following day to prepare for the upcoming Festival of Remembrance. We provided musical support for the several events and the Remembrance Service in the Garrison Church in Windsor, as well as playing in aid of the Poppy Appeal for the Royal British Legion in three London Railway stations in the same week. In addition, I especially enjoyed the Lord Mayor’s Show on the 9th of November. 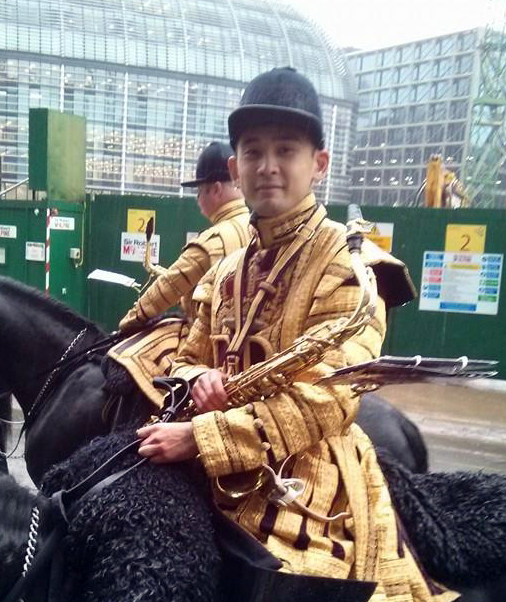 We wear State Dress, I played Tenor Sax on one of the many iconic steeds of the Household Cavalry in the City of London. The variety of events I have been fortunate to participate in as a musician in CAMUS has certainly been very interesting and rewarding… and I have only been in for about six months! I’m looking forward to what is in store for me for the future.